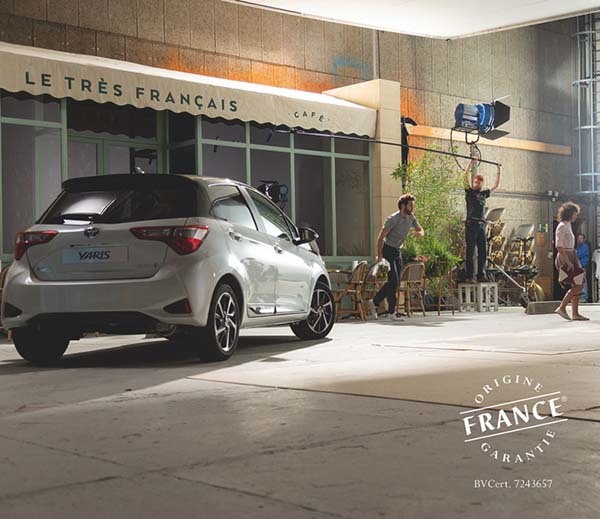 In this film, Dickson stands out with its awning fabric branded « Le Très Français », the campaigns signature. Created in 1836 in the industrial north of France, Dickson has remained in this region ever since. The company was selected because 100% of its awning fabrics are produced, since 1983, on its site in Wasquehal in the suburbs of Lille, 55km from the Toyota factory. Dickson actively participates in the economy and to local and national employment, since it represents today 350 employees in France, supplying Dickson products worldwide. Every day, Dickson Constant produces 100 000m² of fabric through its unique and innovative French know-how, exported worldwide. PROPOSE A TECHNICAL AND DESIGN PRODUCT, IT’S VERY FRENCH! Highlighted in the campaign, the Orchestra awning fabric is Dicksons reference in solar protection. Its solution dyed acrylic fibre coupled with its treatment ensures excellent colour fastness over time, as well as good resistance to water, dirt and tearing. “The ambition is to develop the international character of Dickson whilst remaining a company that cultivates French quality”. As every year and for 6 weeks in Madrid (Spain), the Casa Decor exhibition opens to the public a historic and unique building. Designed by the most popular interior decorators, architects and designers in collaboration with a hundred companies from the housing, luxury, and lifestyle sectors; Casa Decor opened its door on January 23, 2019 in the iconic district of Salamanca. Created in 2009, le lieu du design is a place of dialogue and exchange, aiming at making industrial design and eco-design a major asset and a center of excellence.